In Oklahoma City for one show only. Tickets on sale Friday April 8. (For Immediate Release) – Civic Center Foundation proudly present PENN & TELLER, the critically acclaimed magicians who will perform one show only at Civic Center Music Hall Friday, August 19 @ 8:00 PM. Tickets go on sale Friday April 8 at 10:00 AM at the Civic Center Box Office, at www.okcciviccenter.com or by calling (405) 297-2264. Tickets start at $35.00. For 40 years Penn & Teller have defied labels—and at times physics and good taste– by redefining the genre of magic and inventing their own very distinct niche in comedy. With an amazing eight wins, including 2015, as “Las Vegas Magicians of the Year,” their 15-year run at The Rio All-Suite Hotel & Casino makes them the longest running and one of the most-beloved headline acts in Las Vegas history, outselling every other resident magician on The Strip. 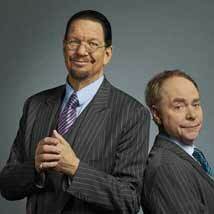 Don’t miss this special engagement: PENN & TELLER at the Civic Center Music Hall, Friday August 19 @ 8:00 PM. Tickets start at $35.00 and go on sale Friday April 8 at 10:00 AM at the Civic Center Box Office, at www.okcciviccenter.com or by calling (405) 297-2264. PENN & TELLER is presented in Oklahoma City by the Civic Center Foundation.